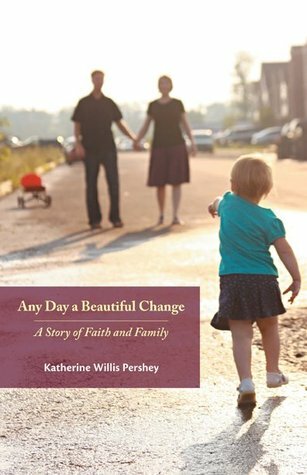 ANY DAY A BEAUTIFUL CHANGE: A Story of Faith and Family. By Katherine Willis Pershey. St. Louis: Chalice Press, 2012. 118 pages. Writing one’s memoirs is risky, because it requires one to be rather transparent about our lives. A good memoir not only celebrates one’s successes, it also reveals the pathos and struggles that we endure. Unlike a work of fiction, even ones based on real events, the stories told in a memoir involve the lives of real people whose names are not always changed to protect their identities. When the persons standing at the center of the story are family, especially a spouse and a child, one must be rather circumspect about what is revealed – their interests must be taken into consideration. My own inclination (and family request) is to keep family matters relatively private, but to make this a compelling story, and the author of this Any Day a Beautiful Change, Katherine Willis Pershey, takes a leap of faith and opens up her life and that of her family for our viewing. This is the story of a young woman who is a pastor (a Disciples of Christ pastor currently serving as the associate minister in a United Church of Christ congregation in suburban Chicago), who is married and has two children – one of whom figures prominently in the book. Before moving to her current position Katherine served as pastor of a small Disciples congregation in a Southern California beach town – much as I had done prior to my move east. Indeed, Katherine and I were colleagues in Southern California, so I’ve known her for a number of years. Over these years, I’ve come to admire her as an author. Any Day a Beautiful Change is rooted in Katherine’s blog, but of course in this context, her testimony is more developed and more focused. It is a courageous book because it tells stories that many of us keep close to the vest. In this brief but moving book, we read stories of her struggles with her faith and her spirituality, as well as the difficulties experienced in her marriage, and their journey into parenthood. It tells a story of a quick courtship that is rooted in a mutual love of poetry. There is also the ongoing issue of Benjamin’s alcoholism, and the steps she has to take to be supportive of his own efforts to find sobriety, which he is able to experience. Not long after they are married, Katherine seeks to follow a calling to ministry, and so she heads to California, a place far from their Ohio home. From seminary to ordination and on to ministry, we follow the trail. 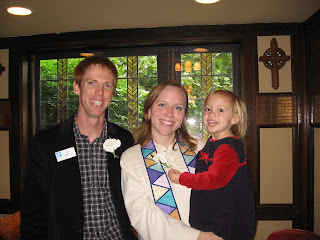 She takes a small congregation – just twenty-four at the time – and seeks to be its pastor. It’s an older congregation that sits along the Pacific Coast Highway. From experience I can tell you that it’s not easy being a pastor of a beach town church. It is there that she becomes pregnant and gives birth to their first child, Juliette. This reality requires church, pastor, and spouse to make some adjustments – and they do. Benjamin becomes the stay-at-home dad, while the church becomes surrogate grandparents. It’s a struggle to balance ministry and family, but for the most part it is pulled off with aplomb. There is a deep love for this congregation expressed in the book, but there is also an expressed desire to return to the Midwest, and when the opportunity presents itself, they take it. 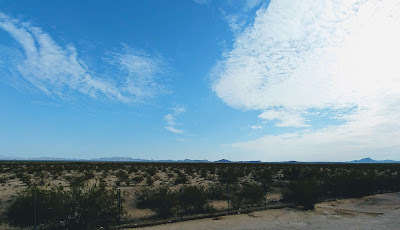 Now, being that I’ve lived a healthy portion of my life in California, I must confess to be mystified by her joy at leaving Southern California to take up a new ministry in the Midwest. But then, she’s from these parts – unlike me! This is a book, as the subtitle declares, about family and faith. Katherine invites us into her story, to experience her both the joys and the disappointments of life. She shares her struggles with both family and faith matters, especially the challenges of juggling parenting with ministry. As we read this book we discover that women clergy who are married and are parents encounter a very different set of issues than those of their male colleagues (like me). In part this is because all of this is rather new – we’ve not exactly figured out the roles! But there are different expectations and roles played mothers in our society. While her husband chose to stay home with their daughter during the early years of parenthood, there still are different expectations. We also share in the stories of pregnancy, birth, disappointment with doctors, struggles with post-partum depression. For those of us of an earlier generation (one generation earlier for me), we also learn something of attachment parenting and the family bed. I must admit I’m still mystified by all of this, but then each generation seems to do this parenting thing differently! My parent’s generation is sure we’ve messed our kids up too! The test of a good author is keeping someone who isn’t part of your intended audience engaged. As a fifty-four year-old male member of the clergy, I could easily engage with the issues of ministry and even juggling ministry and family, but there are the generational and the gender issues involved. I must confess that reading about lactation and leaking breasts and the description of vaginal birth aren’t the usual kind of stories that I focus on. Part of me says – too much information – and yet I understand the importance of this honest and open portrayal of life today. Even though there were times when I might have been tempted to put the book down – had Katherine been a lesser author – she found a way to keep men engaged. When I might have found myself distracted, she reconnected me to the story. The book’s title comes from Katherine’s blog, and the book has its origins in that blog. But as I noted earlier, the key to understanding the message of the book is to look to the subtitle. This is the story of family, in all of its grandeur and travail. It is also a story of faith – of one woman’s faith journey that is lived in the context of her family and in ministry. She deals with theology in a very experiential way, illustrating her developing understandings of faith as she lives as wife, mother, and pastor. We hear the confession that so many of us resonate with of struggling to connect head and heart, of moving from abstraction to reality. It is in the context of family that her faith evolves and blossoms. She admits that family comes before ministry, noting that she understands why a single person can be more responsive to the needs of congregations. And yet, as she notes, her life experience as wife and mother has enriched her ministry. Indeed, as she writes so eloquently: “So even if I have moderately compromised my pastoral vocation by strapping myself with a spouse and child, in noteworthy ways I’m a better pastor for it” (p. 110). As I said, there are risks undertaken in writing such an honest and open memoir, but Katherine pulls it off. I am amazed at her graceful style as a writer, especially for one so young. There is an eloquence and ease with which she writes. Thus, I know that we will hear from her many more times as she blesses us with this gift of writing.